The first Umayyad, indeed Islamic silver coinage was copied from the Sasanian Drachm. The Arabs had just conquered the Sasanian Empire and they continued to use their monetary system. At first these Dirhams didn't differ much from the Sasanian coins they copied, but by the third decade of Islam, marginal writings started appearing on these Dirhams [Bism Allah] leading eventually to the replacement of the pahlavi script and the Yesdigrid era dating with Arabic script and Hijri Dating. "In this year 'Abd al-Malik b. Marwan Struck Dinars and Dirhams and he was the first to innovate them in an Islamic manner and that benefited people. The reason for this innovation was that he ['Abd al-Malik] ordered that paper shipments to the Romans be stamped with [a Koranic Aya] "qul huwa Allahu Ahad" and that mention the Prophet PBUH be made with the date. That displeased the Roman King who wrote back: "You have made certain innovations which if you don't rescind, you will find our Dinars struck with a mention of your prophet that will displease you." That was a threat that 'Abd al-Malik would not accept. He sent for Khalid bin Yazid bin Muawiyah to consult him. 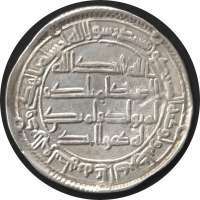 Khalid's council was: "Forbid their Dinars and strike a new coinage which mentions Allah". And thus the Dinars and Dirhams were struck. Then al-Hajjaj struck Dirhams which included the above mentioned Koranic Aya, but the people did not favor that. The stature of the Koran, they argued, was being compromised on coinage that was to be used and touched by infidels. He [al-Hajjaj] forbade anyone else to strike coins, but a Jewish merchant named Samir struck some anyway. He was taken to be executed, but Samir argued that his Dirhams had more silver content than al-Hajjaj's. Then he demonstrated that to the people who were not aware of silver content, but simply weighed coins one against another. The first to order quality control on the striking of silver and the maintenance of it's purity was Amr bin Hubayr in the days of Yazid bin 'Abd al-Malik. Then Khalid bin 'Abd Allah al-Qasri during the days of Hisham bin 'Abd al-Malik became even more strict. Yussuf bin Amr was not as strict, but when he once tested the content and found it lacking a unit ['Iyar] he ordered that the minters be struck 1000 whips each. There were 100 minters and 100,000 whips were administered. 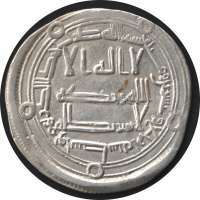 The Hubayrid, Khalided and the Yussufed Dirhams were the best coins of banu Umayya, and al-Mansur would not accept other than these. So the first coinage was identified as "the hated coinage". Some though argue that the coins identified as "hated" were the ones struck by al-Hajjaj [see above]. The Persian ['Ajam] Dirhams were of all different sizes and weights and they used to strike some at a weight of 20 Qirat and others at 12 Qirat and still other at 10 Qirats and these were the variations of the official weights. When Islamic coins were struck, they took the three weights together and found that to be 42 Qirats and then took one third of that as the standard and that is 14 Qirats. And that made the weight of each 10 Dirhams 7 Mithqals. 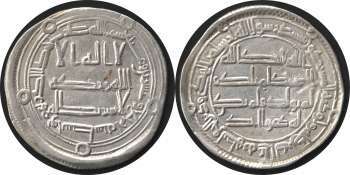 It was also said that Mis'ab bin Zubayr struck a few Islamic coins during the reign of his brother 'Abd Allah bin Zubayr and that these were taken out of circulation during the reign of 'Abd al-Malik, but the truth is that 'Abd al-Malik was the first to strike Islamic coins." Muhammad is the messenger of God. He sent him with guidance and the true religion to reveal it to all religions even if the polytheists abhor it.